You can activate and deactivate a whole autoresponder series or even a message within that series. Find the series and click on the "Settings" button. Then click on the "Deactivate" option. Find the message and then click on the "Settings" button. 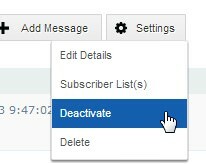 Then click on the "Deactivate" option.